On June 24, 2016 the North Carolina General Assembly adopted the Veterans Day Parade held in the Town of Warsaw in Duplin County as the official State Veterans Day Parade (S.B. 160). The bill to adopt the parade was ratified on June 15, 2016 and signed into law by the governor on June 24, 2016. In the ratified bill, the General Assembly cited a number of reasons for the significance of the Town of Warsaw and Duplin County in selecting the parade as an official state adoption. The legislation cited the location of Duplin County in the center of surrounding military installations in North Carolina, the importance of these centers to the development of some of the nation's most important military leaders, the number of citizens the Town of Warsaw has sent to serve their country in times of war, and for the long history of the Town's annual Veterans Day Parade. The General Assembly recognized the history and longevity of the Town's annual parade as the "oldest, continuously held Veterans Day Parade in the United States." The Town of Warsaw began holding the annual parade in 1921 and the celebration is generally believed to be the oldest, continuously observed Veterans Day Parade in the United States. The first Veterans Days in the U.S. -- held on November 11 and then called Armistice Day -- was declared by President Woodrow Wilson in November 1919. That day was the first U.S. commemoration of the armistice that ended World War I in Europe, beginning at 11:00 a.m. on November 11, 1918. On May 13, 1938, the U.S. Congress made November 11 an annual legal holiday to be celebrated as Armistice Day to honor World War I veterans. In 1954 in the wake of World War II and during the Eisenhower presidency, the act was amended to change "Armistice" to "Veterans" to commemorate and honor American veterans of all wars. Following the Town of Warsaw's 1921 commemoration of Armistice Day, the Greensboro Daily News published a recap of the event. It was, the paper wrote, "The biggest celebration Warsaw has ever held." The day included a parade through town lead by a brass band and the Charles R. Gavin post of the American Legion, along with former servicemen from the county, school children on foot and in floats, and decorated automobiles. A program was held in the school auditorium and the speaker of the day was I. M. Bailey of Jacksonville. The day ended with a football game won by the visiting team. The Town of Warsaw's American Legion Post 127 had just recently been organized and the Armistace Day event was led by its founders, which included Judge Henry L. Stevens, Jr. who served as its first Post Commander. The post was named in honor of Charles R. Gavin, a native of the town, who was assigned to the Army's 81st "Wildcat" Division and is believed to have died in battle in the Meuse-Argonne offensive in France on November 10, 1918, just hours before the armistice. In 1945 following the end of World War II, a reported 15,000 attended the Warsaw celebration that included an address by North Carolina U.S. Congressman Graham Arthur Barden. 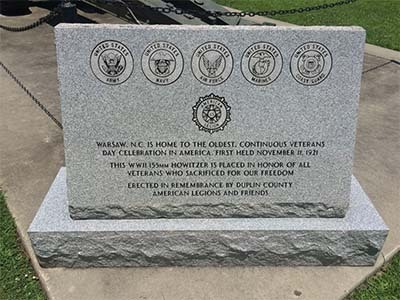 Today North Carolina has approximately 775,000 living resident veterans, and the Town of Warsaw commemoration endures. Commemorative Landscapes of North Carolina. "Duplin County Veterans Howitzer." http://docsouth.unc.edu/commland/monument/491/ (accessed June 15, 2016). "Armistice Day Generally Observed at Warsaw Friday." Greensboro Daily News (Greensboro, N.C.), November 13, 2016. "Armistice Day to be Observed at Warsaw." The Wilmington Morning Star (Wilmington, N.C.), November 10, 1922. Governor's Working Group on Veterans, Service Members and Their Families. "North Carolina by the Numbers." http://ncveteransworkinggroup.org/north-carolina-by-the-numbers/ (accessed June 15, 2016). WUNC-TV. Warsaw Veterans' Day Celebration | NC Weekend | UNC-TV. Oct 31, 2014. https://youtu.be/VxlFmYl8iMQ (accessed August 12, 2016). Commemorative Landscapes of North Carolina. [Duplin County Veterans Howitzer, granite marker.] Photograph. http://docsouth.unc.edu/commland/monument/491/ (accessed June 15, 2016).